1. 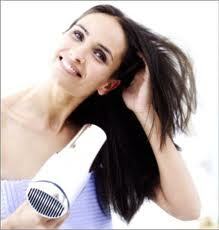 Blow-drying the hair makes it straighter and easier to comb and style. It is a good alternative to achieving a straighter look without using harsh chemicals that can affect the scalp. 2. Many persons find it easier to undertake the styling process (e.g. braiding) when the hair is straighter and dry, however, if you choose not to blow-dry the hair, you can move right into creating a style (e.g. braiding or twisting). 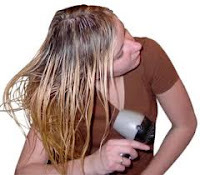 Blow-drying is most easily done section-by-section through the hair. After you've combed out the hair, oiled the scalp and twisted each section, remove one clip at a time and blow-dry each section individually. Use a blow-dryer with a comb nozzle attachment. 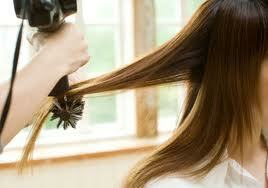 Blow-dry each section, drying the ends first, and then drying the hair down to the scalp. 1. Wash the hair no more than once a week or once every week and a half (7-10 days), more than that can dry it out. 2. Use the pads of the finger in a "scratching" motion to cleanse the scalp/roots, rather than using hands to lather entire head (Using gentle and direct "scratching" motions will reduce tangling). 3. Comb the hair out while you're conditioning it to remove the tangles while it's wet and relatively slick. 4. Using a leave-in conditioner after washing helps when combing through hair and blow-drying with an attachment (It can also help protect hair from the heat of blow-drying). 5. Do a deep conditioner or hot oil treatment once a month. 6. For youth that exercise and sweat, rinse the salt out of the hair even if you don't wash it (Condition it afterwards with a daily leave-in conditioner).